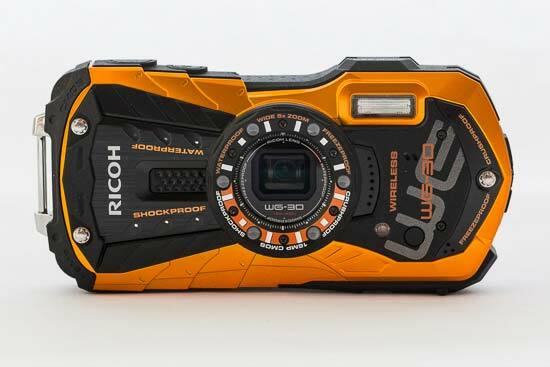 The Ricoh WG-30 Wi-fi is a “tough” camera, which is waterproof, shockproof, freeze proof and crushproof. 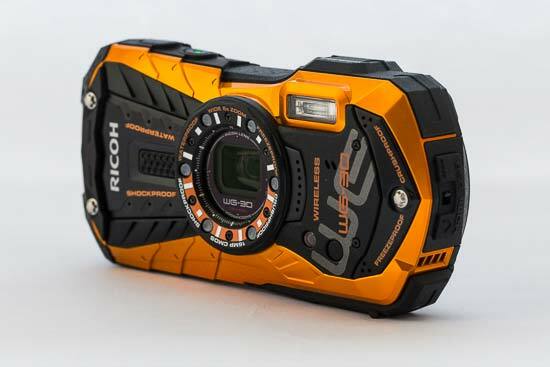 It features a 16 million pixel, back-illuminated 1/2.3 inch CMOS sensor, and has a number of other interesting features. The 5x optical zoom lens covers a 35mm equivalent area of 28-140mm. Digital zoom is also available. 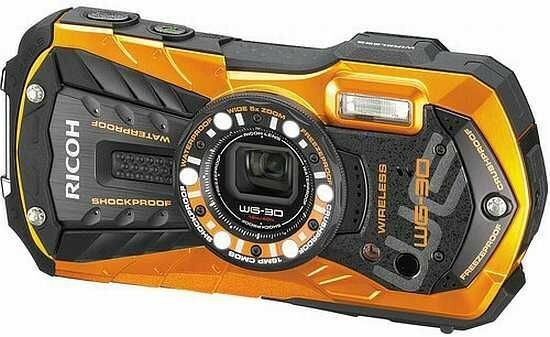 The WG-30 Wi-fi is equipped with Wi-Fi connectivity which means that you can connect your smart device to the camera to remotely control it, and view images already taken on it. It's not possible to take full manual control of the camera, but there is a wide range of automatic and scene modes available. The Ricoh WG-30 Wi-fi costs £259.99 / $379.95. The Ricoh WG-30 Wi-fi has quite a distinctive look, especially if you go for the orange colour - such as the one we were supplied as a sample. The benefit of having a brightly coloured camera is that you should be able to see it more easily if you drop it while using it on your adventures - such as while on a snow covered mountain. It's quite a long camera, but it's slim enough to slip into a relatively loose trouser pocket, and it's also quite light too. On the top of the camera there are two buttons, the on/off button, and the shutter release. These are situated quite close together, and although the power switch is smaller than the shutter release, it can be quite easy to accidentally confuse the two while you are using the camera with reduced visibility, i.e. underwater. 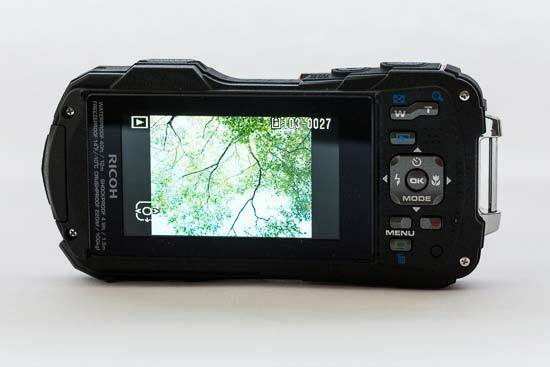 The rest of the Ricoh WG-30 Wi-fi's buttons can be found on the right hand side of the back of the camera. Grouping all the buttons together like this makes it easy to use the camera one-handed, which is particularly useful for a rugged camera. Buttons which you'll find here are the zoom buttons (marked W - wide and T- telephoto), a playback button, a menu button, a video record button and a four way navigational pad. Each of the buttons on the navigational pad doubles up for another function - up accesses timer, right macro focusing, left flash options and the down button the shooting mode. In the middle of the pad is an OK button. The final button is a green button, which is used for different functions depending on the shooting mode you're in - in automatic mode, pressing it twice will activate the camera's Wi-Fi. The buttons are a little on the small side, which in normal circumstances is fine, but if you're wearing thick gloves, you may find it a little difficult to use the camera. On the plus side, they're nicely raised up from the body, so if you're using it underwater, it's easy to feel the ridges of the different button outlines. Around the lens on the front of the camera, you'll see that the Ricoh WG-30 Wi-fi has a ring of LED lights. These have a couple of applications - they are primarily designed to be macro lights for assisting when photographing something very close up. The camera comes with a stand which you can place it on to allow you to photograph something flat very close up. They're also useful when you're shooting self-timer shots underwater, as the lights will flash in sequence to indicate the camera's shutter release is about to fire. There is a dedicated button for video recording which is just underneath the four way navi-pad. Pressing this will activate the video recording, and the good thing about this button's position is that it's unlikely you'll accidentally press it and record video you don't want to. Pressing the down key on the four way pad allows you to choose from the different shooting modes which the camera offers. Here you'll find a range of automatic and scene modes, including underwater mode, which is useful to activate when you are shooting in water. If you want to take a little more control over your shots, you may be disappointed to note there are no semi-automatic or manual modes, but you can choose to use a Program mode which gives you a little more control. If you use Program mode, you can take control of certain settings, including white balance and metering. In order to make these changes, you'll need to go into the main menu, and scroll through the options which are presented. While this menu is fairly sensibly arranged, if you come out of the menu and go back in, you'll need to scroll to the setting you want to change again - a little frustrating if you want to change a particular setting fairly frequency. There are two doors on the Ricoh WG-30 Wi-fi, one for the battery and memory card compartments, and the other where you plug in USB and HDMI cables. Both doors are protected from accidentally opening by lock switches which you must hold down before you can slide open the doors. These switches aren't quite as robust as something you might find on a more expensive model, but they do the job regardless. Although the WG-30 has Wi-Fi, it's not immediately obvious how you control the camera from your phone or tablet. After activating the Wi-Fi on the camera, you connect to the camera via your phone using the password which is displayed on the screen. Although Pentax has an app available to use with its DSLR cameras, that's not how you use it with the Ricoh WG-30 Wi-fi. Instead, you load up any web browser on your phone, and type in 192.168.1.1 in the address field. Then you'll be able to remotely control the camera or view and download images you've already taken with the camera. Unlike with many Wi-Fi remote control applications, you can control quite a few different elements from your phone, including white balance, focus type, ISO, exposure compensation and so on. You can also zoom the lens in and out. Autofocusing speeds are fairly quick when you're in good light, but when the light drops you may find the Ricoh WG-30 Wi-fi hunts a little more before it's able to acquire focus. Switching to macro focusing allows you to get incredibly close to a subject, but occasionally it can take a little time for the subject to snap into sharp focus. Overall, the Ricoh WG-30 Wi-fi is a fairly easy camera to get to grips with, and as long as you don't want to take control of too many elements of it, you should find it easy to use.